The band unveiled the ripping 'Sunday Driver' and bluesy 'Now That You're Gone' on Dec. 19. Jack White is never far from your speakers. Whether dropping solo albums, efforts by Dead Weather or overseeing the steady stream of musical marginalia from his Third Man Records label, the Detroit-bred guitarist/singer is always on his grind. And on Wednesday (Dec. 19) he re-booted yet another of his side projects, the Raconteurs, dropping the first new music we've heard from the band in over a decade. Again teaming with fellow singer/songwriter Brendan Benson, bassist Jack Lawrence and drummer Patrick Keeler, White blessed this holiday season with a two-pack of fresh music in the form of the rocking "Sunday Driver" and the bluesy ballad "Now That You're Gone." On the former, White wails over bright, slashing guitars and a swinging beat, yelping the chorus, "Ain't it right?/ Ain't it wrong?/ It's a fact/ Sing my song." Benson takes the lead vocal on "Gone," his sweet voice soaring over the spare, thudding bass and swinging soul tempo, crooning, "Never known such unhappiness/ Never thought it would end like this/ Oh, what will I do, now that you're gone?/ Now that you're gone." 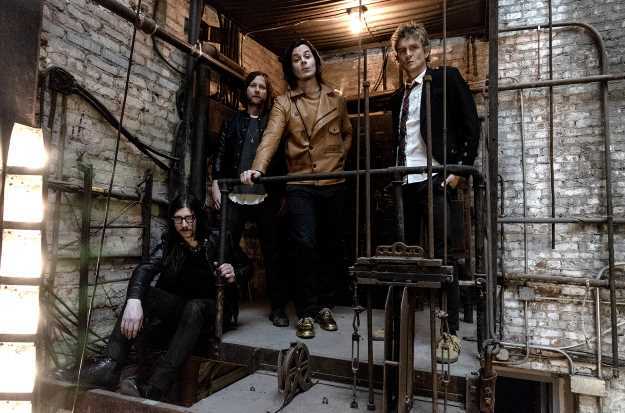 The tracks are the first we've heard from the occasional supergroup since 2008's Consolers of the Lonely album and Third Man recently announced that a third Raconteurs album is on the way next year. The songs were accompanied by two videos, a moody, black and white film noir-style clip for "Now That You're Gone" directed by Dikayl Rimmasch and starring burlesque performer Gia Genevieve and a frenetic, 360-style clip for "Sunday Driver" directed by Steven Sebring. Click here to download the tunes.